BEPS Action 5 is one of the four BEPS minimum standards which all Inclusive Framework members have committed to implement. One part of the Action 5 minimum standard is the transparency framework for compulsory spontaneous exchange on certain rulings which, in the absence of transparency, could give rise to BEPS concerns. Over 100 jurisdictions have joined the Inclusive Framework and will take part in a peer review to assess their compliance with the transparency framework.Specific terms of reference and a methodology have been agreed for the peer reviews to assess a jurisdiction’s implementation of the minimum standard. 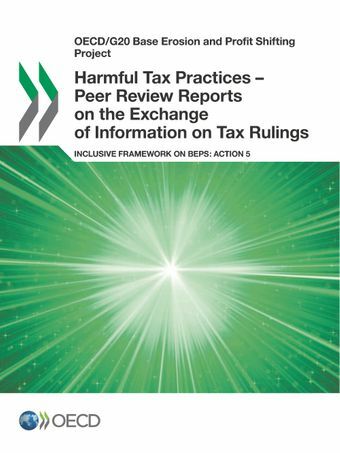 The review of the transparency framework assesses countries against the terms of reference which focus on five key elements: i) information gathering process, ii) exchange of information, iii) confidentiality of the information received; iv) statistics on the exchanges of rulings; and v) transparency on certain aspect of intellectual property regimes.This report reflects the outcome of the first peer review of the implementation of the Action 5 minimum standard. It covers the jurisdictions which participated in the BEPS Project prior to the creation of the Inclusive Framework, and it assesses implementation for the 1 January 2016 – 31 December 2016 period.